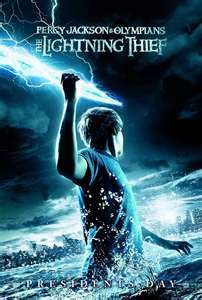 Percy Jackson is a troubled twelve-year-old who’s been diagnosed with dyslexia and ADHD and been kicked out of every school he’s ever attended. Then in sixth grade, his life really starts to tank. Particularly when his pre-algebra teacher turns into a bat-winged monster and tries to kill him. Things go from bad to worse until he learns he’s only half human. Then the fun really begins. The one drawback to using the ancient gods in a book for kids is their legendary tendency toward promiscuity. In Camp Half-Blood, where Percy goes for the summer, a cabin is built for each god to collect all the cast-off children he or she has created with mortals. In a book for kids, this background of complete social dysfunction makes me cringe. But Riordan’s handling of it never crosses any bounds of propriety, never prompts kids to start asking questions that demand uncomfortable answers. It’s simply a pitfall of featuring gods. I greatly appreciate the restraint Riordan uses concerning inappropriate language. It’s nice to make a recommendation without having to include that post script. One of my favorite things about The Lightning Thief is the way it becomes personal immediately. Warning kids right off that they might share Percy’s half-blood condition, that they too might be in danger, lends his predicament authenticity and sends a thrill of danger through the reader. It sure caught me right away. Riordan also makes effective use of his chapter titles. With headings like “I Accidentally Vaporize my Pre-algebra Teacher” and “Grover Unexpectedly Loses his Pants,” what kid isn’t going to keep reading? I have to admit that those first paragraphs of the Lightning Thief creeped me out. It got me thinking, what if it was real?!?! I really like how Rick Riordan writes! The Battle of the Labrinth was my favorite book of the series. So if you got to choose who your immortal parent was, who would it be? I would want mine to be Athena (of course I wouldn’t trade my real mom for her HA! HA!). I’ve decided. I’d want Hephaestus. His kids are creative, work with their hands, and don’t mind working alone. Sounds like me!